Chaired by Alan Dukes, Chairman & Co-founder Asia Matters, this is a closed and invitation only event for members and senior stakeholder guests. The Asia Matters Business Awards recognise Irish Companies with a strategic focus on Asia and Asian companies making significant investment in Ireland. Entering the awards is easy and there is no fee. The changes happening in Asia represent some of the most important challenges and opportunities for global business today. Discover the key drivers and technologies that matter for decision makers adapting to the new Asian Future. Dan Byrne, Co-Founder Lincor Solutions Ltd.
Paul Murray, Investment Director Atlantic Bridge Capital Eugene Murphy, Founder & CEO, Indeemo. This member and invitation only CEO and Senior Executive briefing is by invitation only. A senior industry panel will follow the key address. An Asia Matters delegation led by Chairman Alan Dukes and Executive Director Martin Murray will visit Beijing 26 and 27 February 2018. For more details please contact samantha.hobbs@asiamatters.biz. 11.15: A Conversation with Ann Riordan, Chairman Science Foundation Ireland and Asia Matters Advisory Board Member with Expert Panel on Attracting and Retaining Global Talent. For firms it is critical to look beyond geographic borders to attract and retain top talent to drive international growth. For cities and regions to compete internationally for FDI, it is vital that top talent is supported by world class research and innovation clusters. 12.30: A Conversation with Lionel Alexander, Chairman Institute of Technology Tralee, Board Member IDA Ireland and Asia Matters Advisory Board Member & Expert Global Investor Panel on ICT/Pharma. ICT and Pharma are established business clusters in Cork and are globally acclaimed as key economic drivers - the expert panel will discuss critical factors for future success. The Theme is Post Brexit Need for Ireland’s FDI Industry to Embrace the Asia Opportunity. Martin D. Shanahan is CEO of IDA Ireland. IDA (Industrial Development Agency) is Ireland’s inward investment promotion agency responsible for the attraction and development of foreign investment in Ireland. Martin took up this position on the 1st September 2014. Prior to this, Martin was Chief Executive since 2010 of Forfás – Ireland’s policy advisory board for enterprise, trade, science, technology and innovation. Martin worked in a number of senior executive roles in Forfás since joining the agency in 2005. Martin has been to the forefront of the development of enterprise and innovation policy in Ireland including leading, at official level, the development of the Government’s Action Plan for Jobs between 2011 and 2014. Martin has represented Ireland at EU and International fora. Before joining Forfás, Martin worked in Fáilte Ireland (the National Tourism Development Authority) responsible for the professional development of the tourism sector. Earlier in his career Martin held a number of senior management positions in the private sector in tourism and hospitality. Martin holds an M.Res (Educational Research) from Lancaster University, a M.Sc. and H.Dip from Dublin Institute of Technology and a B.Sc (Mgmt) from Trinity College Dublin. He has undertaken executive education in economics at Oxford University and at the Kennedy School of Government in Harvard. Martin is a board member of IDA Ireland and previously has been a board member of Forfás and the Management Advisory Committee of the Department of Jobs, Enterprise, and Innovation. Martin is a member of Ireland’s National Competitiveness Council. He has previously been a member of the Advisory Council for Science, Technology and Innovation, and Ireland’s Expert Group on Future Skills Needs. Martin is a member of the Institute of Directors and a Fellow of the Irish Hospitality Institute. The Theme is Post Brexit Need for Ireland’s Export Industry to Embrace the Opportunity in High Growth Asian Markets. Julie Sinnamon is CEO of Enterprise Ireland, Prior to her appointment to CEO in November 2013, Julie held a number of senior public sector positions, spanning a 30 year career in Enterprise Ireland and IDA Ireland. Julie is a member of the Board and Investment Committee of Enterprise Ireland and a member of the Investment Committee of the Irish Strategic Investment Fund, part of the National Treasury Management Agency. She has been recently appointment to the National Competitiveness Council. She is also a Board Member of the Social Entrepreneurs Ireland and Young Scientist & Technology Exhibition Limited. 1. 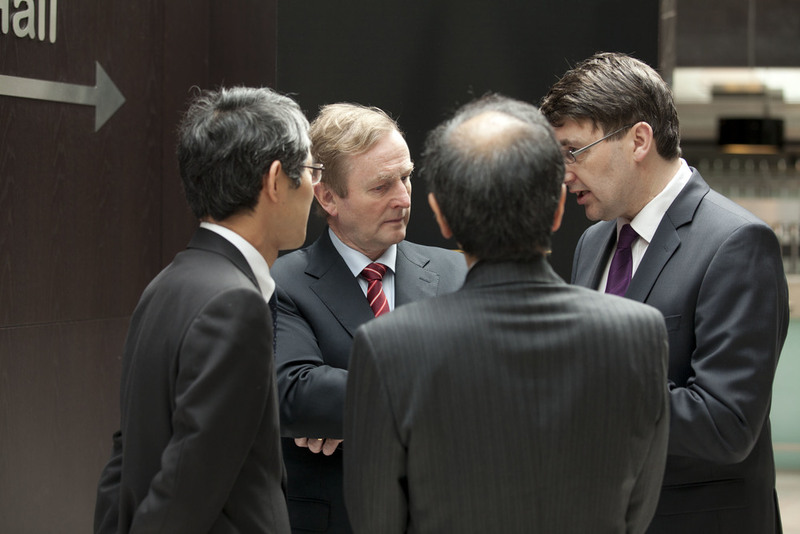 An Overview of the Scale of Asian Markets including Japan and Korea and Niche Sectors in which Ireland has Competitive USP. 3. New Insights into the Chinese Market Opportunities. Bord Bia has now launched the Origin Green brand in China with a Chinese language website. Irish food and drink exports to China have grown tenfold in ten years to reach €654 million and Bord Bia estimates China will be a €1 billion market in the next three years. Aidan Cotter was appointed Chief Executive of Bord Bia in 2004, having previously served as Operations Director and prior to that in Bord Bia positions based in London and Dusseldorf. He is a graduate of University College, Dublin and Cranfield University in the UK from where he holds Masters Degrees in economics and business administration respectively.